Bethlehem, PA – September 19, 2018 – Saladax Biomedical Inc., a diagnostics company providing kits to test drug blood levels for personalized dose management and adherence, announced today that it welcomes new guidelines from the International Association of Therapeutic Drug Monitoring and Clinical Toxicology (IATDMCT) that “strongly recommend” monitoring levels of 5-Fluorouracil (5-FU) in patients on treatment. 5-FU is a commonly used chemotherapy drug that is the backbone of treatment regimens for colorectal cancer, other gastroenterology cancers, head and neck cancer and other solid cancers. The publication is a rigorous examination of the literature data on the benefits of 5-FU therapeutic drug monitoring (TDM). TDM is the measurement of drug levels in blood. Its greatest value is for drugs that, when overdosed, can be severely toxic and, when under dosed, are ineffective. 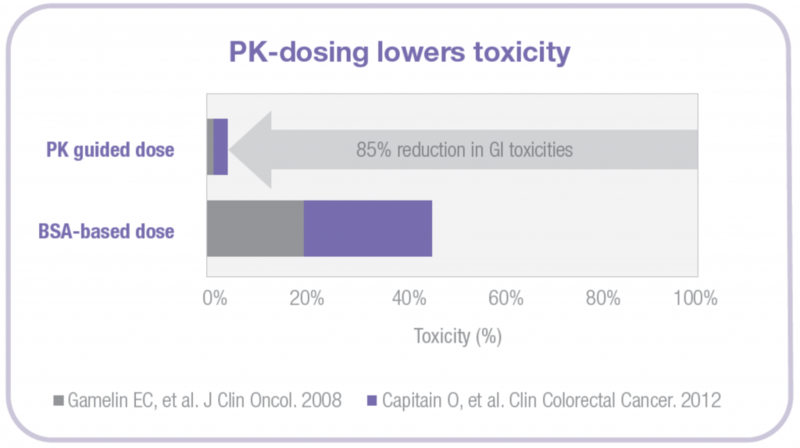 Clinical studies have demonstrated that TDM improves treatment by lowering toxicity and improving effectiveness. The IATDMCT paper examined the evidence for using TDM and strongly recommends TDM for the management of patients on 5-FU therapy. Several studies have shown that BSA-based dosing results in suboptimal 5-FU levels. One study, published in Clinical Colorectal Cancer in 2011, looked at colorectal cancer patients who were treated with different 5-FU regimens: FOLFIRI, FOLFOX6, and FOLFOX6 with Avastin®. Figure 1 shows the results of the study. It is hard to believe that 51% of patients were under dosed and 13% were overdosed, and that only 36% of patients who were dosed by body surface area were in the target exposure range for optimal chemotherapy benefit. Suboptimal 5-FU levels result in treatment that is not effective, resulting in continuous growth of the cancer. Using TDM can reduce the number of patients receiving suboptimal doses of 5-FU. TDM is the process of using a blood level test to determine if the optimal dose of drug is given to a patient. If the dose is too low, the doctor can increase the next dose and vice versa. This is repeated until the patient is within the accepted range. Figure 2 is from a study of 357 patients who were treated with a standard 5-FU regimen with standard BSA dosing. The circled dots in the figure highlight the number of patients who were under dosed with 5-FU in the first cycle. 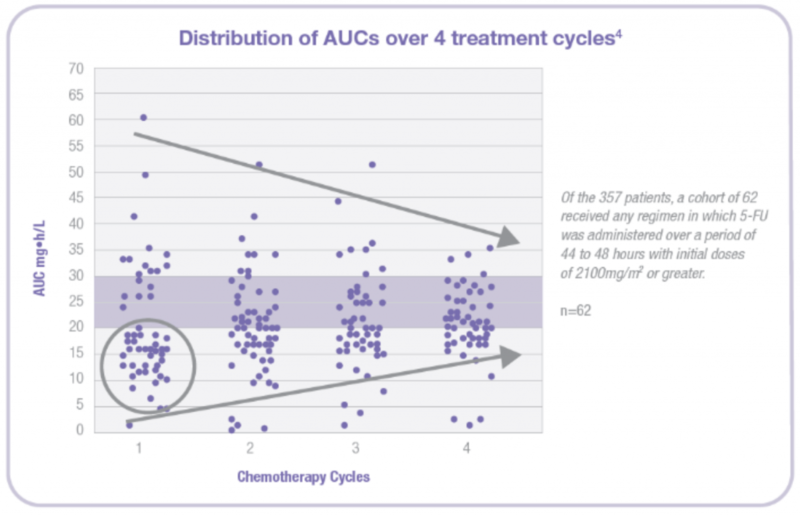 It is easy to notice that very few patients are within the purple bar, which represents the optimal target range achieved with a personalized dose. In this study, TDM was used to understand which patients were sub optimally dosed. Doctors used this data to either increase or decrease the dose. With each subsequent cycle, more and more patients achieved the optimal 5-FU range. Figure 4 represents patients whose adverse effects from 5-FU were reduced substantially with TDM. 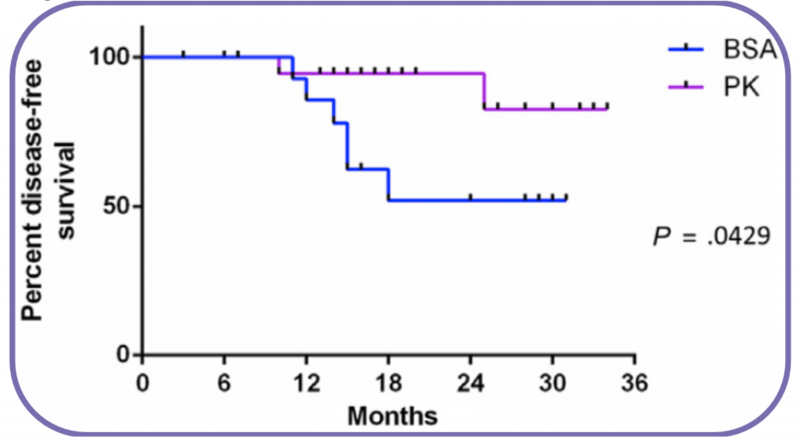 Figure 4 is a powerful image of how TDM, the top light purple line, increased the percent of patients whose treatment resulted in longer disease-free survival. It also shows that fewer patients dosed using BSA, the lower blue line, had disease-free survival. Studies prove the advantages of TDM dosing which is why Saladax welcomes the new guidelines from IATDMCT. No patient should be given a suboptimal dose when simple and inexpensive tests are available to optimize dosing. While TDM has been proven useful for care in other indication areas of medicine, such as neurology and transplantation, it has never been widely adapted in the field of oncology. There has been a growing body of evidence suggesting TDM could improve patient care in oncology. “We hope the IATDMCT guidelines will encourage all oncologists to stop dosing patients solely on body surface area, but rather on good scientific rationale,” said Dr. Salamone. Saladax was founded on the premise that the availability of high-quality tests for chemotherapeutics could improve patient care by making TDM more accessible. Saladax’s technology has been shown to be beneficial and useful in recent clinical studies.